Mecz można wygrać, przegrać lub zremisować. A match can end in a win, a loss, or a draw. Piłka jest okrągła, a bramki są dwie. The ball is round and there are two goals. Praca trenera jest jak molo – kiedyś się kończy. Coaching is like a pier – eventually it comes to an end. Dopóki piłka w grze, wszystko jest możliwe. As long as the ball is in play, anything is possible. Tak się gra, jak przeciwnik pozwala. You can only play the way the other team lets you play. Nasza reprezentacja gra bosko – Bóg jeden wie, jak zagra. Our team plays divinely – only God knows how. 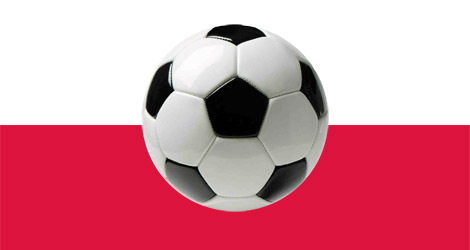 I am a journalist from China, and right now I am in warsaw corvering Euro 2012. I read your article about racists and jewish people living in Poland and BBC documentary, which I am really interested in. If it is possible, I would like to go to Krakow to have a chat with you. I also would like to do an interview with Jonathan Ornstein with your kind help. My cellphone number in Poland is 537050771, please call me if you see this. Good idea to provide a few vocabulary items for Euro 2012, but what has ‘We was robbed’ got to do with it? It suggests that you can easily get robbed in Poland while you are here for Euro and I think it’s not very nice to give such impression, especially that it’s not true. Zuzanna, relax. ‘We was robbed’ is a common expression used in the UK about football matches in which a bad refereeing decision has been made – in other words ‘we were robbed of the victory/goal’ The other phrases in the list are also footballing cliches. Churchill and Curzon robbed us big time.